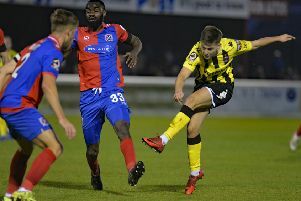 With virtually a third of the National League season jampacked into the first two months AFC Fylde boss Dave Challinor knows how vital continuing their good start is. The Coasters squeezed into the play-off spots last year, eventually losing out to Boreham Wood. But for Challinor, the key to setting them up for another promotion battle is a good start. Last year that first win in the National League came at the sixth time of asking, a 2-0 win over Hartlepool. This time around, Fylde opened the season with a win against Bromley followed by the midweek draw at Wrexham. This afternoon, they head to Havant and Waterlooville to meet a team playing in the National League for the first time. Challinor said: “We are in a better place than we were last year after two games. “To get that first win has been good. I still think we can get better but every game is a different test. “Saturday is no different, going there to a team that has had two promotions and has come into this league for the first time. Captain Lewis Montrose and defender Jordan Tunnicliffe will miss the trip due to injury but Danny Rowe is still at the club after Fylde fought off suitors on deadline day. The early league table sees the Coasters in seventh with only Chesterfield, FC Halifax Town, Gateshead and Solihull Moors having taken maximum points. “It is always difficult at the start of the season,” Challinor said. “Last year it took an awful long time for things to settle down and pan out. “I don’t think you look into it too much. “We found last year it is about being consistent. “There are bound to be ups and downs and when you do lose games, which is inevitable, that you respond the right way and bounce back. “We have just got to keep focusing on ourselves.